One of the most important parts of cleaning and organizing a place is to start with de-cluttering. You must move the items back to its original places. If there are items that don’t belong to your living room, take those items away. Also, keep the books, pen, newspapers and showpieces back to their original places. If you have kids at your home, then you will know that toys often remain scattered all over the places. Pick them up and keep them in the toy boxes. It may take a lot of time for you to de-clutter the entire living room. But once you de-clutter it, half of your work seems to be done. You will find the living space much more organized and tidy. This is one of the significant living room cleaning tips. 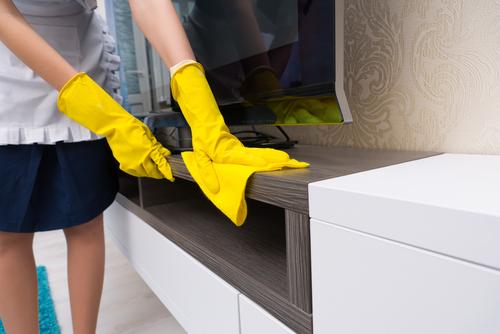 You must wipe down all the surfaces of your living room to ensure that there is no dust or dirt residue. Start with the coffee table and then move to the shelves, vases, lamps and any other hard objects or surfaces in the living room. For this you can take a clean piece of cloth and dust away all the dirt and debris. Otherwise these dirt and dusts can cause allergies and diseases. Cushion covers also need a lot of attention. A lot of dusts and dirt get accumulated on the cushion cover over the time. You must ensure that they are properly cleaned. Otherwise it can be quite harmful for the environment. If you have pets at home, then their dander can also be found in the cushion cover. So, it is important to remove the cushion covers and clean them in the washing machine twice every month. Same goes for the curtains for the windows in the living room. You must wash them properly every month so that there are no dusts on it at all. This is probably one of the toughest parts of cleaning. 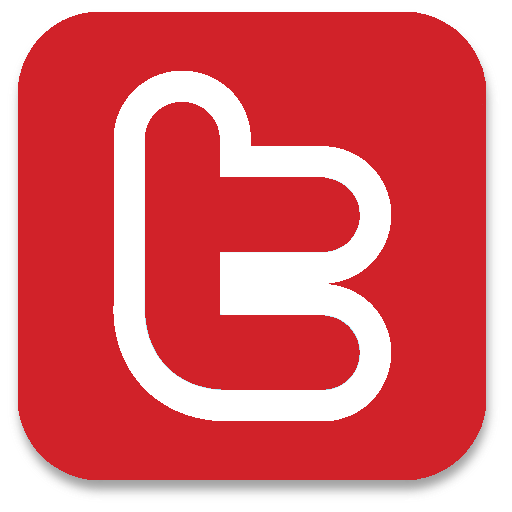 Maximum amount of dust and dirt can be found in the carpets. People come from outside and directly step on over the carpet, with or without shoes. So, this area definitely needs your maximum attention. Carpet can have a lot of debris, dust and pet hair which can lead to infections and asthma problems. Even in hot and humid climates, there is a high chance of mold growth in your carpet. Thus, make sure to clean the carpet twice a week. You can use the vacuum cleaner to clean the carpet thoroughly. Make sure not a single inch is spared as bacteria and viruses can grow vigorously from that very part. Of course, cleaning the upholsteries can be a little bit challenging for you. But it is one of the most effective living room cleaning tips that must know. If there are stains on your upholsteries, then make sure to remove it. Before you start removing the stain with the solution and water, it is important to remove the dusts. Otherwise it can get muddy. So, you must use the vacuum cleaner all over your upholsteries to ensure no dust or dirt is left behind. Now for cleaning any stain, you will need a cleansing solution which is effective on upholsteries. Dab the cleansing solution on the solution and let it sit for few minutes. Then take a clean brush and scrub gently. It must do the magic. Then dab a dry cloth on it and blow dry the area immediately. Moist upholsteries can encourage molds to grow. Living room is incomplete with a television. Every household has a television of their own and you must clean that too. You will notice that over the time TV screen will have fine dusts accumulated on it. Take a clean cloth made up of delicate microfibers for cleaning the TV screen. You have to wipe the screen very gently with the cloth. Otherwise you may get scratches on the screen. Once you are done, you can also use this same cloth for cleaning any surfaces on your living room that are made up of glasses. Another important tip for cleaning your living room is to clean the windows and doors too. People often overlook the windows and doors but there can be a lot of dusts and debris on it. Even the window grilles will have dusts too. Windows and doors are exposed to storms, heat, dusts and rains outside. Thus, they need to be brushes and cleaned regularly so that they are clean and tidy. So, these are some of the essential living room cleaning tips that you must follow to get the best result. 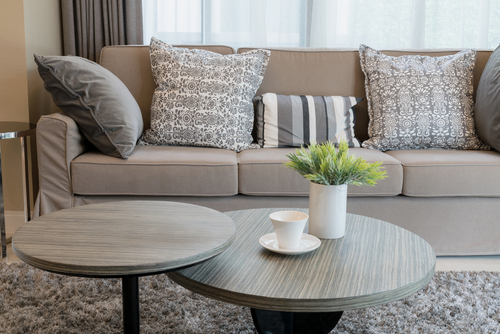 A clean and tidy living room can leave a great impression on the mind of your guests as well. Also, it is essential for the overall health and wellness of your family. Keeping the living room clean and well-organized can also uplift the beauty of your entire house. You can see a drastic change in the appearance of your living room after cleaning it. 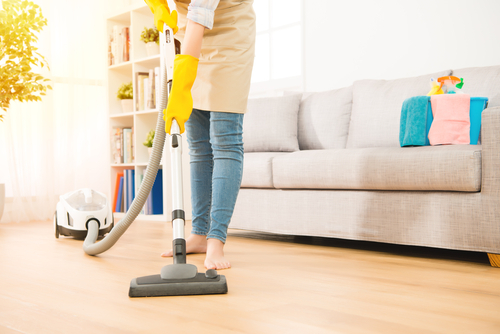 It is important to take out 15 to 20 minutes daily and work on cleaning the living room.